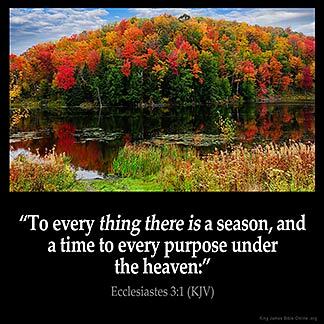 ECCLESIASTES 3:1 KJV "To every [thing there is] a season, and a time to every purpose under the heaven:"
To euery thing there is a season, and a time to euery purpose vnder the heauen. For everything there is a fixed time, and a time for every business under the sun. 3:1 A season - A certain time appointed by God for its being and continuance, which no human wit or providence can alter. And by virtue of this appointment of God, all vicissitudes which happen in the world, whether comforts or calamities, come to pass. Which is here added to prove the principal proposition, That all things below are vain, and happiness is not to be found in them, because of their great uncertainty, and mutability, and transitoriness, and because they are so much out of the reach and power of men, and wholly in the disposal of God. Purpose - Not only natural, but even the voluntary actions of men, are ordered and disposed by God. But it must be considered, that he does not here speak of a time allowed by God, wherein all the following things may lawfully be done, but only of a time fixed by God, in which they are actually done. It means that we must have patience to wait for God time. You must have faith in God. Gods time is never our time. His purpose is that we be free to know all things work together for the good to them that love God and to those that are called according to His purpose. God 's timing is never to late or to early He is always on time.So have faith and know when you are slipping off the edge he is there to catch you before you fall and hit the ground.Praise the Lord!